Harrison Gray Otis, the owner of the Los Angeles Times, was a leading figure in the fight to keep the trade unions out of Los Angeles. This was largely successful but on 1st June, 1910, 1,500 members of the International Union of Bridge and Structural Workers went on strike in an attempt to win a $0.50 an hour minimum wage. Otis, the leader of the Merchants and Manufacturers Association (M&M), managed to raise $350,000 to break the strike. On 15th July, the Los Angeles City Council unanimously enacted an ordinance banning picketing and over the next few days 472 strikers were arrested. On 1st October, 1910, a bomb exploded by the side of the newspaper building. The bomb was supposed to go off at 4:00 a.m. when the building would have been empty, but the clock timing mechanism was faulty. Instead it went off at 1.07 a.m. when there were 115 people in the building. The dynamite in the suitcase was not enough to destroy the whole building but the bombers were not aware of the presence of natural gas main lines under the building. The blast weakened the second floor and it came down on the office workers below. Fire erupted and spread quickly through the three-story building, killing twenty-one of the people working for the newspaper. The next day unexploded bombs were found at the homes of Harrison Gray Otis and of F. J. Zeehandelaar, the secretary of the Merchants and Manufacturers Association. The historian, Justin Kaplan, has pointed out: "Harrison Gray Otis accused the unions of waging warfare by murder as well as terror.... In editorials that were echoed and amplified across a country already fearful of class conflict, Otis vowed that the supposed dynamiters, who had committed the 'Crime of the Century,' must surely hang and the labor movement in general." William J. Burns, the detective who had been highly successful working in San Francisco, was employed to catch the bombers. Otis introduced Burns to Herbert S. Hockin, a member of the union executive who was a paid informer of the (M&M). Information from Hockin resulted in Burns discovering that union member Ortie McManigal had been handling the bombing campaign on orders from John J. McNamara, the secretary-treasurer of the International Union of Bridge and Structural Workers. McManigal was arrested and Burns convinced him that he had enough evidence to get him convicted of the Los Angeles Times bombing. McManigal agreed to tell all he knew in order to secure a lighter prison sentence, and signed a confession implicating McNamara and his brother, James B. McNamara. Other names on the list included Frank M. Ryan, president of the Iron Workers Union. According to Ryan the list named "nearly all those who have served as union officers since 1906." Some believed that it was another attempt to damage the reputation of the emerging trade union movement. It was argued that Harrison Gray Otis and his agents had framed the McNamaras, the object being to cover up the fact that the explosion had really being caused by leaking gas. Charles Darrow, who had successfully defended, William Hayward, the leader of the Industrial Workers of the World (IWW), when he had been falsely charged with the murder of Frank R. Steunenberg, in 1906, was employed by Samuel Grompers, head of the American Federation of Labor, to defend the McNamara brothers. One of Darrow's assistants was Job Harriman, a former preacher turned lawyer. John J. McNamara and James B. McNamara. On 19th November 1911, Lincoln Steffens and Charles Darrow was asked to meet with Edward Willis Scripps at his Miramar ranch in San Diego. According to Justin Kaplan, the author of Lincoln Steffens: A Biography (1974): "Darrow arrived at Miramar with the sure prospect of defeat. He had failed, in his own investigations, to breach the evidence against the McNamaras; on his own, he had even turned up fresh evidence against them; and, in desperation, hoping for a hung jury and a mistrial.... Steffens, who had interviewed the McNamaras in their cell that week, asking for permission to write about them on the assumption that they were guilty; he had even talked to them about changing their plea. Darrow, too, was approaching the same stage in his reasoning. It was tragic, he had to agree with the other two, that the case could not be tried on its true issues, not as murder, but as a 'social crime' that was in itself an indictment of a society in which men believed they had to destroy life and property in order to get an hearing." Scripps suggested that the McNamaras had committed a selfless act of insurgency in the unequal warfare between workers and owners; after all, what weapons did labour have in this warfare except "direct action". The McNamaras were as "guilty" as John Brown had been guilty at Harper's Ferry. Scripps argued that "Workingmen should have the same belligerent rights in labour controversies that nations have in warfare. There had been war between the erectors and the ironworkers; all right, the war is over now; the defeated side should be granted the rights of a belligerent under international law." Lincoln Steffens agreed with Scripps and suggested that the "only way to avert class struggle was to offer men a vision of society founded on the Golden Rule and on faith in the fundamental goodness of people provided that they were given half a chance to be good". Steffens offered to try and negotiate a settlement out of court. Darrow accepted the offer as he valued Steffens for "his intelligence and tact, and his acquaintance with people on both sides". This involved Steffens persuading the brothers to plead guilty. Steffens later wrote: "I negotiated the exact terms of the settlement. That is to say, I was the medium of communication between the McNamaras and the county authorities". Steffens met with the district attorney, John D. Fredericks. It was agreed the brothers would change their plea to guilty but offer no confession; the state would withdraw its demand for the death penalty, agree to impose only moderate prison terms, and also agree that there would be no further pursuit of other suspects in the case. Darrow argued in his autobiography, The Story of My Life (1932): "The one reason that made me most anxious to save their lives was my belief that there was never any intention to kill any one. The Times building was not blown up; it was burned down by a fire started by an explosion of dynamite, which was put in the alley that led to the building. In the statement that was made by J. B. McNamara, at the demand of the State's attorney before the plea was entered, he said that he had placed a package containing dynamite in the alley, arranged the contraption for explosion, and went away. This was done to scare the employees of The Times and others working in non-union shops. Unfortunately, the dynamite was deposited near some barrels standing in the alley that happened to contain ink, which was immediately converted into vapor by the explosion, and was scattered through the building, carrying the fire in every direction." On 5th December, 1911, Judge Walter Bordwell sentenced James B. McNamara to life imprisonment at San Quentin. His brother, John J. McNamara, who could not be directly linked to the Los Angeles bombing, received a 15 year sentence. Bordwell denounced Steffens for his peacemaking efforts as "repellent to just men" and concluded: "The duty of the court in fixing the penalties in these cases would have been unperformed had it been swayed in any degree by the hypocritical policy favoured by Mr. Steffens (who by the way is a professed anarchist) that the judgment of the court should be directed to the promotion of compromise in the controversy between capital and labour." As he left the court James McNamara said to Steffens: "You see, you were wrong, and I was right". Justin Kaplan, the author of Lincoln Steffens: A Biography (1974) has pointed out: "Steffens' principled intervention proved to be a disaster, and to the end of his life he worked to secure a pardon or parole for the McNamaras and, by extension, for himself... He had wholly misjudged the ferocity of the opposed forces." Steffens told his sister: "What I am really up to is to make people think. I am challenging the modern ideals... The McNamara incident was simply a very successful stroke in this policy. It was like a dynamite explosion. It hurt." Steffens idea of the Golden Rule (a faith in the fundamental goodness of people) was much attacked by radicals. The militant union leader, Olav Tveitmoe, commented: "I will show him (Steffens) there is no Golden Rule, but there is a Rule of Gold". Emma Goldman also attacked Steffens for his approach to the case and what she called "the appalling hollowness of radicalism in the ranks in and out of the ranks of labour, and the craven spirit of so many of those who presume to plead its cause." Walter Lippmann, who had previously greatly admired Steffens, described him as the man who believes that "lions will not act like lions when they lie down with lambs". Max Eastman, editor of The Masses, suggested that Steffens should have been transmitting his "kindly and disastrous sentiments" about practical Christianity to a Sunday-school class instead of to the courts. Ella Winter, who married Steffens several years later, explained in her autobiography, And Not to Yield (1963): "The labor movement was nonplused and infuriated, for despite the concession Stef had wrung from judge and employers of relatively light sentences and no castigation from the Bench, J. B. was given life and John J. fifteen years - and a sizzling indictment from the Bench. Stef was reviled and mocked, attacked by friend and enemy. His protégé, Jack Reed, wrote a satiric poem called Sangar, jeering at Steffens' naïveté. Stef had described to me the trunkfulls of denunciations that reached him; from then on, no magazine would publish him. I had the impression that he never ceased to feel a certain self-reproach, and he had worked tirelessly for the men's release." Dynamite transport conspiracy charges were brought against forty-six union officials in February 1912. President Frank M. Ryan and Herbert S. Hockin were among the forty-six Ironworkers charged. The trial began on 12th October and the following month thirty-nine men were found guilty and sentenced, including Hockin who had given evidence against his fellow union members. Ryan received the longest sentence and served seven years in Leavenworth Penitentiary. The one reason that made me most anxious to save their lives was my belief that there was never any intention to kill any one. The Times building was not blown up; it was burned down by a fire started by an explosion of dynamite, which was put in the alley that led to the building. In the statement that was made by J. B. McNamara, at the demand of the State's attorney before the plea was entered, he said that he had placed a package containing dynamite in the alley, arranged the contraption for explosion, and went away. This was done to scare the employees of The Times and others working in non-union shops. Unfortunately, the dynamite was deposited near some barrels standing in the alley that happened to contain ink, which was immediately converted into vapor by the explosion, and was scattered through the building, carrying the fire in every direction. (2) The journalist Lincoln Steffens visited the McNamara brothers in prison during their trial. I spoke to Darrow, who gave me permission to see his clients, and that afternoon, when court adjourned, I called on them at the jail. There were J. B. McNamara, who was charged with actually placing and setting off the dynamite in Ink Alley that blew up part of the Times building and set fire to the rest, bringing about the death of twenty-one employees, and J. J. McNamara, J. B. 's brother, who was indicted on some twenty counts for assisting at explosions as secretary of the Structural Iron Workers' Union, directing the actual dynamiters. He was supposed in labor circles to be the commanding man, the boss; he looked it; a tall, strong, blond, he was a handsome figure of health and personal power. But his brother, Jim, who looked sick and weak, soon appeared as the man of decision. I had never met them before, but when they came out of their cells they greeted and sat down beside me as if I were an old friend. A few days later we drove across the bay on my first visit to San Quentin, my first visit to any prison. Our road led along the blue and gold coast at the foot of steep curving hills. The sea shone, and the sun glittered on the waves and rocks right up to the heavy black barred gate. A wide asphalt drive bordered by flowers ran along the coast, and convicts in gray uniform were working in the gardens. I wasn't prepared for flowers. We were taken to the warden's private office while they sent for J. B. McNamara and Matthew Schmidt (J. B. 's brother, John, had been released after serving eleven years). 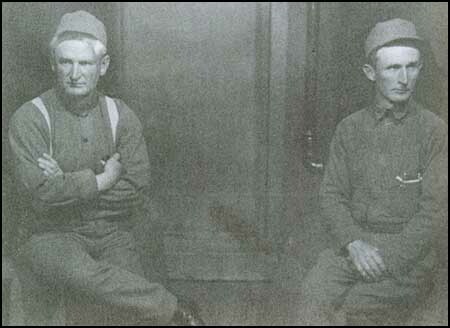 The McNamaras had been militant labor leaders in the early 1900's when unions were making little progress by accepted union methods. The two brothers felt that violence was the only way to draw attention to working conditions and force employers to raise wages. 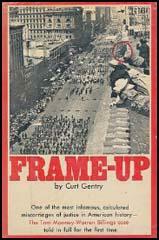 They had embarked - with official labor's support, it was charged - on a campaign of dynamiting. As soon as a new bridge or dam or building was finished, they blew it up. Union labor believed the McNamaras innocent and hired Clarence Darrow to defend them, but as the trial proceeded the prosecution's mounting evidence against them made Darrow doubt he could win. Steffens still believed reason could lead to justice, and was anxious to try out a long-cherished plan to get labor and capital together. He wanted a "new deal" for labor, and hoped that the employers, rather than punishing individuals, would sit around a table and enunciate new principles. But time was short, the employers were too angry to listen, and the fear grew with Darrow and Steffens that the men might be convicted and hanged. Stef finally persuaded J. B., over the prisoner's fierce objections, to change his plea to "guilty." (The argument that finally won his grudging consent was that his elder brother would hang, too.) No client of Darrow's had ever been executed and, Stef told me, Darrow could never bear to face that possibility. J. B. and Matt Schmidt came into the warden's office. They wore faded blue trousers and shirts, and they sat down at once and talked quietly in low, almost monotonous, voices. J. B. was blond and spare, with blazing blue eyes and a silent secret smile that showed gold in his front teeth. "Schmidtie" was dark, stout, jolly, a Micawber type; he kept smiling as he made his sarcastic remarks. "So this is your girl," J. B. said, with a pleasure that thrilled me. "You'll go on with this case when the old men have gotten tired, won't you, Peter, and, after you, Little Pete." J. B. wouldn't talk about himself. We knew from Older that in the jail he befriended young lost boys who came in angry and truculent, and fought for justice inside the prison. For years men came out of San Quentin telling what J. B. had done for them; they almost worshipped him. J.B.'s prison job at the time was feeding the condemned men on Death Row, but he would not talk about that, either. For years we called on J. B. whenever we were near San Francisco. This particular warden was friendly to Older and let us visit with the men in his office; later wardens made me sit on one side of a caged counter, with glass between, all the prisoners together in a room and a guard watching. 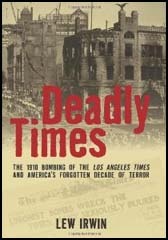 Steffens appealed to every governor for a pardon; he wrote to conservative labor leaders, editors, politicians, to the Chandlers, who owned the Los Angeles Times that had been blown up. It was all fruitless. When J. B. McNamara died in 1941, I said a few words at his memorial service. He had been sent to Folsom, a harsher jail, as punishment for helping other prisoners, and he had also been deprived of his few comforts-slippers, books (including Steffens' Autobiography) , and a strip of carpet he had used for more than a decade. I had gone to Folsom and kept tip my visits to J. B. until, after thirty years behind bars, cancer finally ended his life.